The Marcella Sembrich Museum on the banks of Lake George. Marcella Sembrich (1858-1935) was a great Polish soprano of the past whose life and career are legend. Mme. Sembrich was Gilda to Enrico Caruso’s Duke of Mantua in Giuseppe Verdi’s Rigoletto at his debut in November 1903 at the Metropolitan Opera. They also recorded the Rigoletto Quartet and the Sextet from Lucia di Lammermoor. Caruso, a skilled caricaturist, made several caricatures of his friend Marcella and they are in his book of caricatures. Mme. 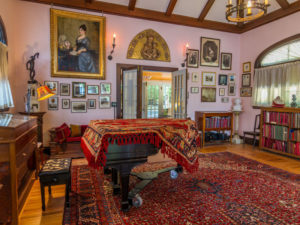 Sembrich bought a pink stucco cottage on the banks of Lake George, NY which became her studio where she taught voice until her passing in 1935. It has since become a museum, shrine and cultural oasis when it is open from June through mid September. This season was an active one and was concluded with a gala honoring the immortal tenor Enrico Caruso (1873-1921) on Saturday, September 2nd. His star has never faded and continues to shine almost a century since his untimely death of a lung abscess at age 48 in his native Naples on August 2, 1921. Richard Wargo, curator and music director, introduced host Barrymore Laurence Scherer, tenor Daniel Montenegro and pianist Michael Clement. Wargo then went to the old wind up phonograph and played Enrico Caruso singing “La Donna e mobile” from Giuseppe Verdi’s Rigoletto. After Caruso’s golden voice negotiated the brilliant cadenza and finale, our tenor of the evening, Daniel Montenegro appeared, accompanied by Michael Clement and sang “La Donna e mobile.” Montenegro possesses a fine lyric tenor that is flexible, with a pleasing tone and theatrical flair. He sang the cadenza and hit the final note with ease and whetted the appetite for the remainder of the program. 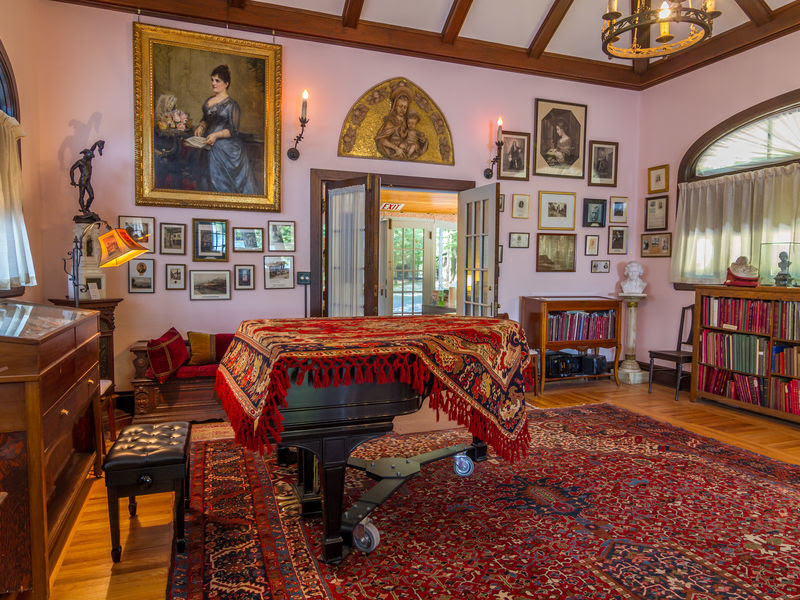 The intimate living room setting for the performance seats close to one hundred guests and has a Victor console and a baby grand piano. Barrymore L. Scherer & Daniel Montenegro. Barrymore Laurence Scherer spoke eloquently of his boyhood, his parents and how the voice of Enrico Caruso played such a large part in all their lives. Scherer especially remembers Caruso’s great recording of “Rachel quand du Seigneur” from Jacques Halevy’s La Juive which was the great tenor’s final performance at the Metropolitan Opera (Met Opera) on December 24, 1920. Mr. Scherer mentioned that while Enrico Caruso was not a matinee idol in looks, he possessed a round kindly face, a pug nose and a smile of comet wattage and his glorious voice was in the right body – He was simply CARUSO! The operatic portion continued with “Una furtiva lagrima” from Gaetano Donizetti’s Elisir d’amore which was sung with lyricism and elan. Montenegro mentioned that Caruso suffered a throat hemorrhage at the Brooklyn Academy of Music (BAM) on December 11th 1920 while singing in Elisir d’amore. Caruso did sing three times more at the Met in great pain afterwards but it signaled the beginning of the end. “Amore o grillo” from Giacomo Puccini’s Madama Butterfly was sung with the proper bravura. “La Fleur que tu m’avais jetée” from Georges Bizet’s Carmen was sung with admirable restraint and a pianissimo high at the finale that was both tender and caressing. 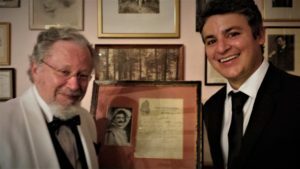 Piano accompanist Michael Clement from Skidmore College and the College of Saint Rose played the Intermezzo from Pietro Mascagni’s Cavalleria Rusticana with all due passion and white hot inspiration. 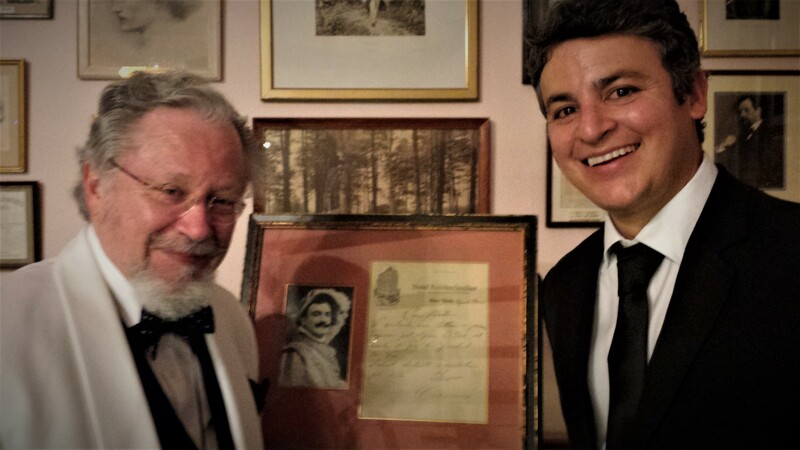 The concert continued with rising tenor Daniel Montenegro singing Neapolitan songs, many of which were immortalized by Enrico Caruso’s Victor recordings. Like Milton Berle who made television, it was Enrico Caruso who made over 240 recordings by use of the phonograph. The phonograph improved in quality to accommodate the demands of the public who clamored for his recordings. The first million seller was “Vesti la giubba” from Pagliacci in 1907. I first heard Daniel Montenegro in La Hija de Dr. Rappiccini (Rappiccini’s Daughter), an opera by Daniel Catán at the Brooklyn Botanic Garden. I praised him highly in my review in The Brooklyn Eagle. Montenegro sang “La danza” by Gioachino Rossini and caught the tarantula spider dizzying madness ending with a sustained high note. “Santa Lucia” by Theodoro Cottrau followed with just a hint of melancholy as Caruso did. Caruso was booed in his native Naples early in his career by a jealous claque and he never sang there again. He exclaimed he would only “go to Naples to eat spaghetti.” He always sang of Naples “Addio mia bella Napoli” and went there to die. 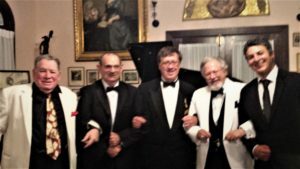 “Tu ca nun chiagne” by Ernesto de Curtis was sung by Montenegro, with true Italianate flair and plumbed the emotional depth and despair with a vocal frisson that was very exciting. Then we heard Core ‘ngrato written for Caruso by Salvatore Cardillo and was sung with intensity, longing and beauty of tone. A virtuoso piano solo by Michael Clement with Rigoletto Concert-Paraphrase, Giuseppe Verdi/Franz Liszt was exciting. I thought of Vladimir Horowitz as the notes and melodies danced together and his fingers flew like winged chariots to fulfill the dynamic pulse of Liszt emulating Verdi in this virtuoso showpiece! “L’ultima canzone” by Paolo Tosti followed, and was a favorite of Caruso contemporary-tenor Giovanni Martinelli (1885-1969) and romantic basso Ezio Pinza. (1892-1957) Montenegro sang it with generous tone, passion and pianissimo shading combined. “Ideale” also by Tosti was sung with profound melancholy with a brilliant high note at the end à la Caruso. Caruso recorded a “Non t’amo piu” early in his career, (1902) written by Luigi Denza, but the one offered by Daniel Montenegro was by Tosti and has become a great favorite of tenors. Montenegro captured every bit of the gripping emotional intensity of this beguiling song in the true Italian way. Next was the charming song “A vuccella” which Montenegro described as “the lady love having lips like a posy that simply have to be kissed.” It was the Caruso hit of 1919. The final number by Stanislao Gastaldon was “Musica proibita” whose haunting melody was so beautifully articulated by Daniel Montenegro right up to the exciting finale. The sold out audience insisted on an encore and the result was “O sole mio” sung not with Carusian melancholy but with Pavarottian joy with some wonderful trills more suited to Montenegro’s vocal terrain. Montenegro’s encore, true to his Latin roots was “Ay, Ay, Ay” (Osmán Pérez Freire) which was sung with brio, charm and some beautiful pianissimi.” His final outpouring was “Princesita” (José Padilla) which was sung with infectious charm. Montenegro loves to sing and shares that joy with his audience. Barrymore Scherer made some closing remarks and concluded his lecture quoting a poem. The poem was written by me in 1963 and was printed in the Brooklyn section of The Daily News in 1971. The poem recalled the 42nd anniversary of Caruso’s death with a recorded 2 hour memorial tribute to Caruso in New York’s Bryant Park! Barrymore Laurence Scherer read the poem with great eloquence and feeling and introduced my wife Judy and myself. I was surprised, proud and humbled by the reading, the mention and the applause! The reception before and after the gala was under a tent outdoors on the glittering shores of Lake George. 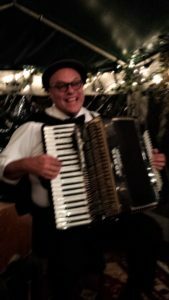 The versatile fleet fingered accordionist Tom Persinos from Boston played many Italian favorites. The delicious finger food, one of which was a meatball with sauce on a toothpick with spaghetti swirled on top was new to me. It was provided by caterer Susan Minucci, owner of The Inn on Gore Mountain in North Creek, NY. It was a joy to “meet and greet” so many opera aficionados and wonderful people midst pastries and cannolis including the artists and enchanting Michelle Scherer, wife of Barrymore. Marcella Sembrich and Enrico Caruso must have joined us on “cloud 9” because that’s where we were! We will inform Commendatore Aldo Mancusi of the Enrico Caruso Museum about this wonderful tribute. Hopefully we will have Richard Wargo come to Brooklyn, sample some good Polish food at Teresa’s on Montague Street. Then a visit to The Enrico Caruso Museum near Sheepshead Bay where Caruso sang on Labor Day for 125,000 people on August 31,1918 at the Sheepshead Bay racetrack as part of the police games. Caruso was made an honorary Police Captain at the ceremonies. A few days earlier Enrico Caruso sang at the convention hall in Saratoga. To stroll the spacious grounds of the Sembrich after a visit to the house and museum and sit on one of the benches and “lookout” points, watching the ducks, boaters and revelers is like being in paradise. We wish to thank Richard Wargo, our gallant and gracious host and “founder of the feast” for his flowers for Judy at the train station and his planning the “surprise” reading of my poem. Richard Wargo and staff, Beth Barton-Navitsky and Michelle San Antonio are to be commended for their efforts on behalf of making treasures from the past still so vital for today. We shall never forget the Enrico Caruso evening at The Sembrich. 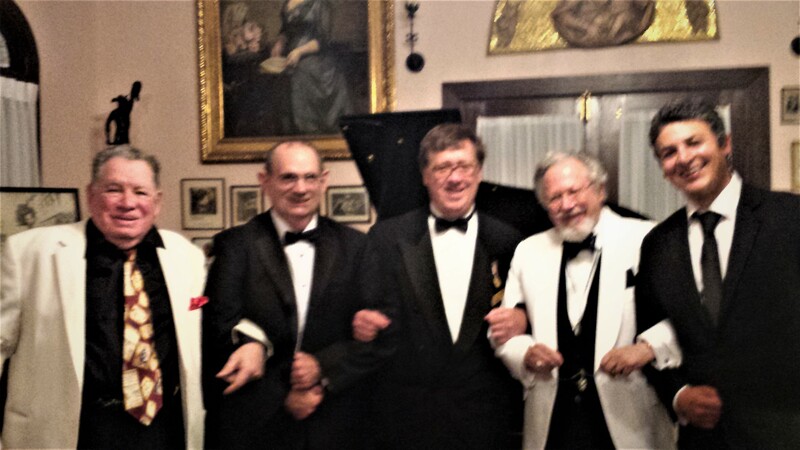 We also thank Barrymore Laurence Scherer, Daniel Montenegro, Michael Clement and Tom Persinos for their talent, skills, devotion and love for recalling the memory of the one and only “King of Tenors” – Enrico Caruso!